A simple setting can mean the difference between a Mac running and a Mac not running when importing multimedia into iTunes. Howz that? Well, if someone has a Windows Home Server, or other device with a large multimedia repository, one could end up in a storage pickle on their Mac. If one wants to catalogue the contents of those folders on their Mac via iTunes, there is a setting therein that could cause a problem. 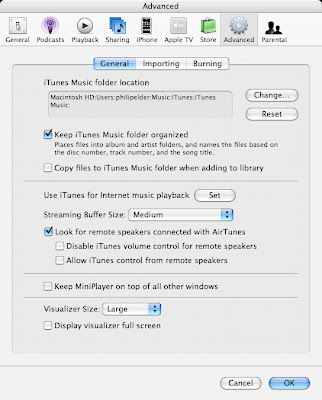 After clicking File-->Add to Library and navigating the Folder Chooser to the shared multimedia folder, iTunes goes off gathering a list of the contents of the folders. If, after starting that process, one walks away the little 160 GB drive on this particular iMac could have eventually been plugged up! It seems that iTunes also pulls a copy of the multimedia file across the network onto the local Mac machine. Might want to verify if iTunes on PC also does the same thing.